We’ve come to expect big things from bestselling author Ann Patchett. As winner of the PEN/Faulkner Award and the Orange Prize for her international beauty Bel Canto back in 2002, Patchett unwittingly raised her literary bar and cleared the way for a large and loyal fan base. Highlighted by the success of Bel Canto, Patchett has amassed a reliable readership and now publishes to eager, outstretched hands. With five praised novels to her name and one currently situated on several prominent reading lists, Patchett has been slow to disappoint. In her latest novel State of Wonder, however, Patchett just might find devotees a touch disenchanted. Patchett’s State of Wonder boldly tackles the snarled, cacophonous wilds of the Amazonian jungle. Yet for all of the novel’s shimmering flora, pulsating hues, masticating insects, shrieking monkeys and tribal ululations, why are we left hearing only crickets? State of Wonder starts out strong despite its floppy premise. The introduction of key characters and plot lines instantly hook and anticipation builds at the first hint of scandal. Like the exhilarating, paced ascent of a roller coaster readying for the ride, readers sense big thrills to come. Alas, as the setting switches from the midwest to Brazil, State of Wonder peters out at the perch and clambers down into a disjointed tale of outlandish proportion. “It’s not that I don’t have any idea; it’s that I sometimes have too many ideas,” shared Patchett in a recent Tin House interview, and this is no doubt the troubling case in State of Wonder. Bioethics, biracialism, corporate greed and cultural integrity are but a few of the many story threads that still remain slack at the conclusion of Patchett’s work. Well put. An author can only take their audience so far before they run the risk of losing them in their own imaginative flight. By the time Patchett has Marina eating bark off the trees and the Lakashi tribe swabbing their private parts for the sake of modern science, it’s fairly safe to say that Patchett has left her readers staring into space. That said, Patchett does have a gift for beautiful prose and her depth of character and relationship are at times palpable. In addition, the lush, layered descriptions of the Amazon and its foreboding tributaries are striking. In all fairness, State of Wonder offers significant literary style if not grace. It’s possible that I might be in my own camp on this one, though it wouldn’t be the first time. State of Wonder was just released on June 7th and is steadily climbing the charts and garnering written raves. Not only does State of Wonder grace the current cover of BookPage, but it’s also a June 2011 Indie Next List selection and was recently featured on The Diane Rehm Show. If you’ve read State of Wonder, NLR would love to know what you think. Ellen Airgood is an unlikely author. Clocking outrageous hours as a waitress and baker at the small diner she owns with her husband in Grand Marais, Michigan, it’s a wonder she has a second to write up anything other than a customer’s tab. Airgood, however, is clearly as resourceful as the colorful characters who appear in her lyrical new novel South of Superior (Riverhead). Released just last week, South of Superior is shaping up to be that perfect summer read. While its charms hold particular appeal for those who reside in Michigan, Airgood’s debut will easily translate to any reader looking for a wise, warm tale of love, life and friendship. Airgood resides in Grand Marais, which sits on the Lake Superior shore of Michigan’s Upper Peninsula and provides the setting for South of Superior. Known as the “Yoop” from those south of the Mackinac Bridge, the UP is nothing short of majestic and remains somewhat of a mystery for those who reside outside of its breathtaking borders. In South of Superior, Airgood grants a glimpse into the rustic lives of those who have called the peninsula home for generations and captivates with its rugged beauty. Airgood will be appearing at several northern Michigan bookstores for signings of South of Superior over the summer. You can link to Airgood’s appearances here but as always, call venues before heading out the door. With school winding down and the impending relief of slackening schedules upon us, many locals will be heading up north to take in their bright summer days on Michigan’s beautiful shores. Whether it’s a few days, a few weeks, or the break in its entirety, tightroutines will quickly unravel letting loose, wanton hours for pleasure reading. While big chain book retailers continue to shimmy, Michigan boasts a solid slew of fabulous independent bookstores throughout the state. An indie worth its salt is staffed with a knowledgable crew that not only loves to shoot the breeze about books, but can often provide you with the perfect pick regardless of your literary appetite. If you’re headed Up North and are looking for a good read, an independent bookseller is a great way to go. Not only will you be falling into unique establishments that house both fringe and mainstream literary works, but also adding much needed fuel to Michigan’s economy and the book industry at large. While I can’t possibly cover all the indies in northern Michigan, here are a few of my personal favorites. Keep in mind that author events, book signings, and related discussions often go hand with individual bookstores. Also, most progressive booksellers roll with the techno tide and provide related links on their homepage and can be followed on facebook and Twitter. If you’re headed to Petoskey, stop in at McLean and Eakin. If you’re headed to Gaylord, stop in at Saturn Booksellers. If you’re headed to Traverse City, stop in at Horizon Books. If you’re headed to Glen Arbor, stop in at Cottage Books. If you’re headed to Northport, stop in at Dog Ears Books. If you’re headed to Suttons Bay, stop in at Brilliant Books (now in Traverse City too). If you know of other bookstores, please feel free to add them in Comments! Tea Obreht, author of The Tiger’s Wife, can now add Orange Prize winner to her ever-blossoming resume. Obreht bested contenders Emma Donoghue (Room), Aminatta Forna (The Memory of Love), Emma Henderson (Grace Williams Says it Loud), Nicole Krauss (Great House), and Kathleen Winter (Annabel) for this year’s prestigious UK award. For those of you who haven’t heard of the Orange Prize, it’s the UK’s annual book award for fiction written by a woman. The award can be presented to a female author of any nationality for the best eligible full-length novel written in the English language. At just 25, Obreht is the youngest author thus far to win the Orange Prize for Fiction. Not only will she take home an awarded “Bessie” sculpture, but also a monetary prize of about $49,000.00. Not bad at all for a debut novel. Tea Obreht was born in 1985 in the former Yugoslavia, and spent her childhood in Cyprus and Egypt before eventually immigrating to the United States in 1997 (via). Her writing has been published in The New Yorker and was highlighted in the highly regarded 20 Under 40 issue. Obreht has also appeared in major publications such as The Atlantic, Harper’s, The New York Times, and The Guardian and was included in the National Book Foundation’s 5 under 35. “Write what you know” is the sage advice for any writer, and clearly Michigan author Jerry Dennis believes in such wise counsel. What Dennis “knows” settled in his heart as a young boy in Grand Traverse County who believed that Lake Michigan was where the world began. The places of our upbringing bear great influence on our lives, and Jerry Dennis has made the very ebb and flow of the Great Lakes define his life’s direction. Well known for his literary works on nature, science, outdoor sports, Michigan waters, and this entire Bountiful World, Dennis has become a respected philosopher in his own right. 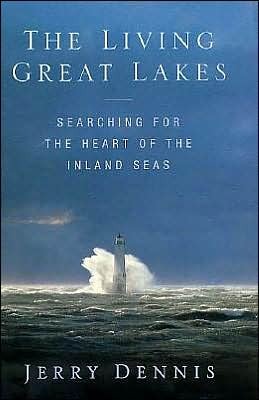 In this wonderful podcast Dennis discusses his book, The Living Great Lakes: Searching for the Heart of the Inland Seas. You can hear the easy rhythms of nature in the cadenced voice of Dennis when fielding questions about his work and his writing process. When asked to briefly comment on the Great Lakes, the author doesn’t rattle back to the old elementary acronym for reference but stuns instead with this heartfelt response. Unfortunately it’s a touch too late to sign up for the this year’s Bear River Writers’ Conference, which apparently fills up months ahead of time, year after year. The upside is that Jerry Dennis has a new book due out this September. The University of Michigan Press will be publishing Dennis’ forthcoming work, The Windward Shore, which is a meditation on winter on the Great Lakes.